The Lost Civilizations of North America documentary is one in a long line of failed attempts to populate America’s ancient past with the denizens of lost tribes, lost cities, and, as its title indicates, lost civilizations. While there are many vernacular meanings of the term civilization, archaeologists tend to use it in a limited and precise way to signify a particular kind of society. For example, in his classic enumeration of the features that characterized humanity’s earliest civilizations, prehistorian V. Gordon Childe (1951) included labor specialization, social stratification, production of a food surplus, construction of monumental edifices, urban settlements, and a consistent system of record keeping (usually, but not always, writing). More recently, Joseph Tainter (1988) added the development of a formal government apparatus to that list. Many claims about the existence of a lost civilization in antiquity are, in effect, warmed-over versions of Plato’s Atlantis myth: Long ago (commonly placed at more than ten thousand years before the present) and far away (on an island in the Atlantic or under the Antarctic ice cap or off the coast of Japan, etc. ), an enormously advanced and technologically sophisticated civilization existed whose impact on human history was vast. In extreme versions of the lost civilization myth, the society in question possessed technologies that even modern people have not mastered. Alas, as the result of some terrible accident or war or natural catastrophe, that civilization was destroyed virtually overnight and thus became “lost.” In such stories, conventional historians and archaeologists are described as being blind to the evidence for such a civilization or, in some cases, well aware of the evidence but part of a longstanding conspiracy to keep it all quiet, lest it upset the convenient apple cart of history concocted in their ivory towers. In one subset of the lost-civilization genre of pseudohistory, the lost civilization is not a previously unknown group of people residing in the clichéd “dim mists of time” but instead an otherwise well-known ancient society that is remarkable primarily as a result of its geography, not for its precocious level of technological sophistication. Even restricting ourselves to just North America, the list of such claims is long—though evidence is short—and includes: Celtic kingdoms in the northeastern United States thousands of years ago (Fell 1976); Coptic Christian settlements in ancient Michigan (based on the so-called Michigan Relics) (Halsey 2009); Roman Jews in Arizona (the Tucson Artifacts) (Burgess 2009); the Lost Tribes of Israel in Ohio (the Newark Holy Stones) (Lepper and Gill 2000); and strange mixtures of various ancient Old World peoples secreted in hideouts in the Grand Canyon in Arizona (“Explorations in Grand Canyon” 1909) and in a cave in southeastern Illinois (Burrows Cave) (Joltes 2003). These claims are predicated essentially on the same notion: ancient Europeans, Africans, or Asians came to the Americas long before Columbus and long—perhaps thousands of years—before the Norse; they settled here and had a huge impact on the native people but then somehow became lost, both to history and to historians. Today, a group of “independent scholars” (a euphemism often used to mean writers without institutional affiliation, formal training, or archaeological experience) trumpet the evidence for these ancient settlers of the Americas, disseminating their revisionist histories—not in refereed, professional journals but in popular books, magazines, and, perhaps most broadly, on websites and in cable TV documentaries. A recent iteration of this “alternative archaeology” (another euphemism, this one used for claims about antiquity lacking in credible scientific evidence) can be seen in the documentary The Lost Civilizations of North America (produced by Steven Smoot, Rick Stout, and Barry McLerran), described on its DVD packaging as “the compelling account of the wanton destruction of an ancient history.” According to the video, this claimed “destruction” is both actual (in the sense of the physical, perhaps intentional, destruction of the archaeological evidence of this civilization) and metaphorical (in the sense of the intellectual denial of its existence). It is the embarrassing admission of the authors of this article that we naively agreed to participate in the program. We do not agree with the vast majority of the interpretations of ancient American history presented in the documentary. While it is tempting to ignore the documentary as nonsense, the high production values coupled with the selective inclusion of academically credible scholars have resulted in its gaining international attention. Glenn Beck featured it prominently and favorably in the August 18, 2010, broadcast of his television program, and the website promoting the DVD claims it won the Best Multicultural Documentary Award at the 2010 International Cherokee Film Festival. In a series of three articles, we will provide a scientific commentary on the interpretations expressed in this video concerning the ancient history of North America, using the documentary itself as emblematic of a far broader attempt to write an alternative history of the New World that is wholly unsupported by any archaeological or historical evidence. In this and two subsequent articles, we will address two questions that are particularly relevant: What is the evidence for the “lost” civilizations in North America? And how did this evidence come to be “lost”? Consensus among investigators in organized fields of knowledge is not a conspiracy to ignore, destroy, or sequester deviant or anomalous evidence, as is implied several times in the Lost Civilizations video. Consensus is based upon recognized rules of investigation and principles of interpretation that have been developed in relation to specific research problems. The emergence of consensus among anthropologists regarding the origin and antiquity of humankind in the New World is no exception. Figure 1. This map shows the configuration of the modern coastlines of northeast Asia and northwest North America, along with the maximum Late Pleistocene extent of the Bering Land Bridge. Its existence, between thirty-five thousand and eleven thousand years ago, provided a broad avenue across which human beings first entered the New World from the Old. The consensus view on this subject among archaeologists (together with geologists and biologists) is based on more than a century of excavating literally thousands of archaeological sites. A convergence of interdisciplinary data indicates that the New World was first populated at least thirteen thousand and perhaps as many as thirty thousand years ago by migrants from Asia (Meltzer 2009). 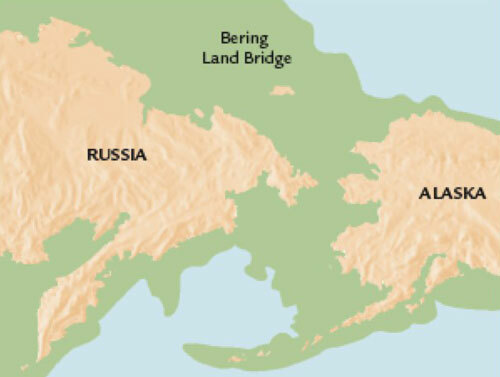 These people entered the Americas via a wide expanse of land—called Beringia—connecting northeastern Asia with northwestern North America during periods of glacial expansion and concomitant lower sea levels (see figure 1). The first human migrants were few in number and entered a continent teeming with wildlife, including many now-extinct forms such as mastodons, wooly mammoths, giant ground sloths, and saber-toothed cats. Exploiting the richness of this “new world,” the human population grew quickly and expanded across the North and South American continents over a few thousand years. As settlers moved into new habitats and as the climate ameliorated at the end of the Pleistocene era (or “Ice Age”) ten thousand years ago, descendants of those first settlers adapted to a great diversity of new and changing environmental conditions, producing an abundance of differing ways of life. Each group adjusted to the natural conditions with which it was faced. In some regions, extremely rich habitats and, ultimately, the development of agricultural subsistence systems allowed for the production of a substantial food surplus and led to the growth of stratified societies with many of the characteristics outlined by Childe and Tainter that define a civilization. Among these were societies of the American Midwest and Southeast—the so-called mound builders—whose ability to marshal the communal labors of large groups of people is clearly seen in an archaeological landscape of monumentally scaled earthworks that include conical burial mounds, truncated pyramids of earth called “platform mounds,” effigy mounds (in the shape of various animals and birds), and vast areas enclosed by geometrically patterned earth embankments (Milner 2004) (figures 2a–2d). It is the archaeological consensus that the myriad cultures seen in native North America, including the mound builders, for the most part developed independent of any external inspiration. Contact almost certainly occurred between ancient societies in North America and the civilizations to the south—there is evidence, for example, of turquoise trade between the native people of the American Southwest and the cultures of Mesoamerica (Powell 2005), and maize, a Mexican domesticate, eventually made its way northward into essentially all regions of the continent in which it could be grown. But there is no credible scientific evidence for the wholesale movement of people from the Old World into sub-arctic North America after the initial incursion from northeast Asia at the end of the Ice Age. Furthermore, there is no scientific evidence whatsoever that the cultural developments exhibited in the archaeological record here—like the monumentally scaled earthworks shown in figures 2a–2d—were in any way inspired by visitors or migrants from Africa, Europe, or Asia (Fritze 2009). Native Americans were fully capable of developing complex and sophisticated cultures on their own without help from other societies. The archaeological record of North America clearly shows the indigenous development of the technologies, art, architecture, social systems, subsistence practices, and engineering accomplishments seen in native America. There is no archaeological or biological evidence for the presence of interlopers, and there is no need for their presence in explaining the archaeology of native America. Sometime toward the end of the last Ice Age, a few Asians stumbled into the New World across the Beringian land bridge. They developed indigenous societies, some of which may have been the beneficiaries of various unspecified contacts from the Old World over the millennia. By two thousand years ago, descendants of the original settlers living in eastern North America were building modest earthworks and scratching out a living by growing a few varieties of local plants. Then, a contingent of Israelites from the hills of Galilee arrived somewhere on America’s east coast, spreading through the indigenous cultures, acting like missionaries and igniting the cultural florescence of the mound-building cultures we know today as the Hopewell (as well as the subsequent Mississippian). These new migrants brought with them their religion (Judaism, apparently) and their written language (Hebrew), which appears in some regions as inscriptions on stone tablets or other artifacts of special significance. They also inspired the construction of vast cities across the Midwest and Southeast, raising up the locals to a high level of civilization, changing fundamentally and forever the cultures and histories of the previously benighted indigenous people. In stark contrast to the elegant consensus achieved by the interdisciplinary work of archaeologists, geologists, geneticists, and linguists (Meltzer 2009; Goebel et al. 2008), recent issues of the diffusionist Ancient American magazine amply demonstrate that there is, in fact, no consensus among diffusionist researchers concerning which African, Asian, or European cultures arrived in America to serve as the elevators of Native American savagery, when they arrived, or which cultural achievements they are supposed to have introduced or inspired. It is a curious statement given the state of archaeological knowledge in the early 1990s. It is possible that Kennedy either did not understand the question or misunderstood its specific context. But it does not follow from such a candid and honest personal admission by a single historian that, as a group, archaeologists and historians were similarly uninformed and that these recognized leaders in the scientific community are therefore the victims (or perhaps the perpetrators) of a conspiracy of silence. It is problematic that the producers based a conclusion on what was effectively a sample size of one before asking the leading question: “Why is it that top historians didn’t know about such things?” Was this really generally true in the early 1990s? Is it true today? In fact, it was not then, and it is not now. To better answer such a question, one might simply have skimmed through the Guide to Departments of Anthropology (published by the American Anthropological Association, a professional organization) for an answer. From that guide one would have determined that there are literally hundreds of archaeologists who have devoted their careers to the study of the mound-builder cultures and dozens of university programs that focus on them. That many (likely, most) Americans don’t know much of anything about the mound builders is unfortunately true, but this ignorance is part of a larger issue. Most Americans don’t know much of anything about Native American cultures, which is of course a shame. But it is an enormous jump to imply from this sad reality that there is any kind of a conspiracy of silence about the sophistication of ancient American mound-building societies. In fact, just the opposite is true. Professional archaeologists in universities and museums have made a concerted effort to get the word out about the mound builders. Archaeologists have written a series of popularly oriented books about mound societies, for example: Milner (2004); Lepper (2005); Pauketat (2009); and Iseminger (2010). Glossy magazines with a broad popular readership have published extensively on the mound-building societies. The magazine of the National Museum of the American Indian (a publication of the Smithsonian Institution) featured an article about Cahokia, the largest of the mound-builder sites, in its Winter 2010 issue (Adams 2010). As we were preparing this article in January 2011, National Geographic magazine published a major piece about that same site (Hodges 2011). It certainly is not the first time the mound builders have been highlighted in National Geographic. Also, over the past few decades there have been numerous articles about the mound-building cultures inArchaeology, the magazine published by the Archaeological Institute of America, aimed at a mixed professional and popular audience (see, for example, Iseminger 1996 and Lepper 1995), as well as in American Archaeology, published by the Archaeological Conservancy. There are dozens of websites, many produced by universities along with the federal and state governments, dedicated to the mound builders in general and specific sites in particular. Typing “mound builders” into a Google search box returns nearly four hundred thousand hits! It’s not for lack of trying on the part of archaeologists and historians that most Americans are ignorant of the mound builders. To imply a conspiracy to keep the public unaware of them is to ignore the facts. Secret Cities of Ancient America? Beyond the factually incorrect conclusion that even at the end of the twentieth century historians were ignorant of the mound-building native societies of the American Midwest, there are additional problems with the Kennedy interview. The first results from an imprecision in terminology, specifically settlement and city. In fact, there is no archaeological evidence of widespread “massive city remains” in North America by any formal definition of the term city. With the possible exception of Cahokia, there are no archaeological settlements in North America that are comparable in size and population density to, for example, the earliest city-states in Mesopotamia, the first cities located along the Indus River in Pakistan, or any of the large urban settlements located in the Valley of Mexico. Even estimates for Cahokia rarely calculate its population at more than ten thousand people, a number sometimes used as a statistical cutoff point for the designation of a settlement as a city (see figure 3). Other than Cahokia, all of the other large mound sites in North America appear to have been a different kind of settlement entirely: not cities but rather ceremonial centers with relatively small residential populations surrounded by numerous hamlets dispersed in vast areas around them. The people living in these hamlets produced the surplus (in the form of food, wealth, and labor) that supported the ritual elites living in the mound centers. In a particularly egregious example of misuse of terminology, the documentary describes the earth embankment that encloses the Newark Earthworks in Ohio as “city walls.” This is nonsense. 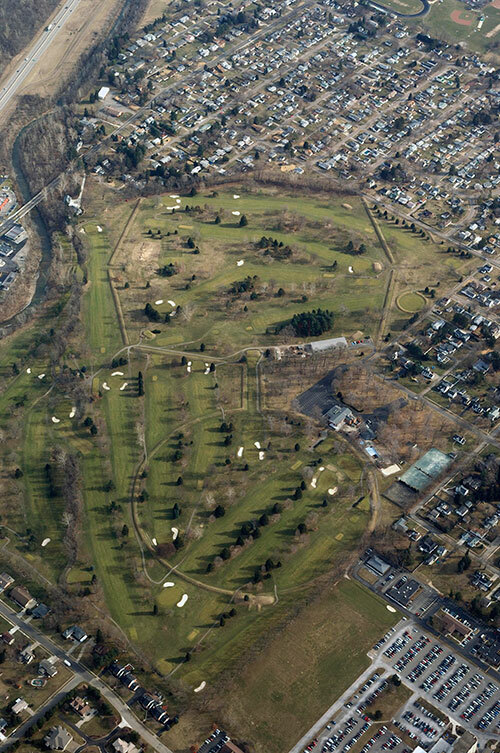 The Newark Earthworks include a spectacular array of more than four and a half square miles of geometric enclosures and mounds in a variety of shapes and sizes, but there is no archaeological evidence for an urban population here (Lepper 2004) or at any of the other monumental earthworks of the Hopewell culture (figure 4). To be clear: stating that places like the Newark Earthworks, Poverty Point in Louisiana (Gibson 2000), Etowah in Georgia, Moundville in Alabama (Welch 1991), Town Creek Mound in North Carolina, or Crystal River Mounds in Florida were not cities is not to disparage them or minimize the achievements of those who produced them. It merely points out the fact, as shown clearly by archaeological investigation, that this architecture was not urban in character and was wholly unlike cities as ordinarily defined. Indeed, one of the fascinating challenges posed by such structures is how a population dispersed in small hamlets without hereditary kings or pharaohs could have organized the labor to erect such massive earthworks. About such sites, the documentary asks: “The real question is, why were these sites not preserved? And why are these advanced civilizations not commonly known of today?” To answer these questions about the perceived lack of preservation of sites from an ancient “lost civilization” in North America, the documentary points to the doctrine of Manifest Destiny and the theory of evolution. It is asserted in the documentary that it was crucial for many Americans in the eighteenth and nineteenth centuries to denigrate the cultural evolutionary status of the native residents. By either destroying or ignoring archaeological evidence of a sophisticated North American civilization, the film’s producers maintain, settlers were clearing their consciences about dispossessing native peoples of their lands. This in itself is hardly a revelation. Manifest Destiny, the belief that the American republic was destined to colonize the trans-Mississippian West, was a largely unexamined assumption that affected scientific attitudes toward Native Americans and profoundly shaped federal Indian policy from the 1840s through the end of the nineteenth century (Horsman 1981). That the mounds were viewed as problematic to those who perceived Native American culture as fundamentally primitive and destined for extinction is an underlying theme of Robert Silverberg’s classic work, Mound Builders of Ancient America (1968). It is a point likewise made in the mound chapter of Kenneth Feder’s Frauds, Myths, and Mysteries: Science and Pseudoscience in Archaeology (2011). So, any notion that the documentary has exposed a conspiracy here is nonsense. And it should be further noted that roughly half of the documentary is devoted to asserting that Native Americans were historically denied civilized status by destruction of their mounds, and the other half is devoted to asserting that the mounds were actually built by interlopers from the Middle East. That unsupported claim denies the cultural achievements and heritage of the mound-building peoples just as surely as did those in the nineteenth century who argued that the ancestors of prehistoric North American Indians had not built the mounds. Implicit in the narrator’s statement that “whether intentional or not, whether motivated by religious or political agendas or not, modern experts agree that wanton destruction did occur” is the suggestion that the mound sites may have been singled out for deliberate destruction to eliminate evidence of an ancient native civilization in North America. This takes great liberty with history. There were those in the nineteenth century who believed they had a duty to both the past and the future to survey and minutely describe prehistoric sites while it was still possible to do so. They were regrettably a minority, but far from an insignificant one. Many of the survey maps used in the Lost Civilizations video, in fact, were the fruit of those historically conscious antiquaries of the nineteenth century (Barnhart 1998, 2005). While the documentary focuses on the “wanton destruction” of prehistoric mounds and geometric enclosures, it largely glosses over the fact that there has been a concerted effort to preserve some of the most impressive of these sites for archaeological research and public education. Many mound sites are open to the public, and many have on-site museums where the public can learn the story of the site’s inhabitants in some depth. One recent compilation lists no fewer than seventy mound and earthwork sites in the states of Indiana, Kentucky, Ohio, and West Virginia that are preserved and accessible to the public (Woodward and McDonald 2002). Among the more prominent are Hopewell Culture National Historic Park, Serpent Mound, the Newark Earthworks, and Fort Ancient Earthworks (see figures 2b, 2c, and 4). These sites, along with Poverty Point National Monument, recently have been placed on a short list by the U.S. Department of the Interior to be nominated for the United Nations Educational, Scientific and Cultural Organization’s World Heritage List. 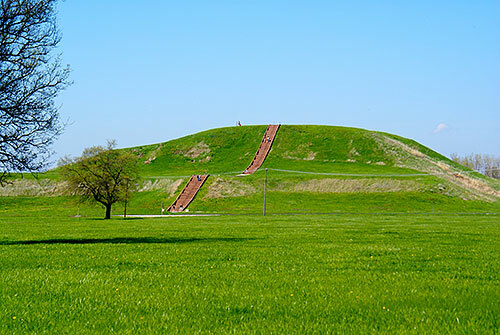 Cahokia Mounds in Illinois is already one of the few prehistoric sites in the United States on the World Heritage List. 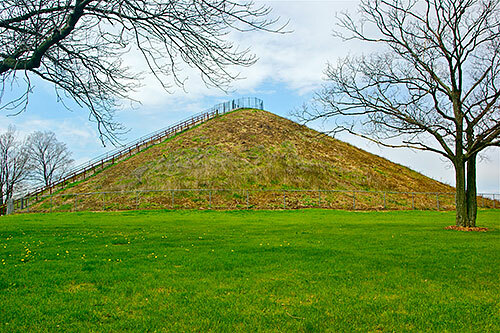 Furthermore, recent figures from Hopewell Culture National Historic Park in Ohio show that between thirty and forty thousand people visit this mound site each year. 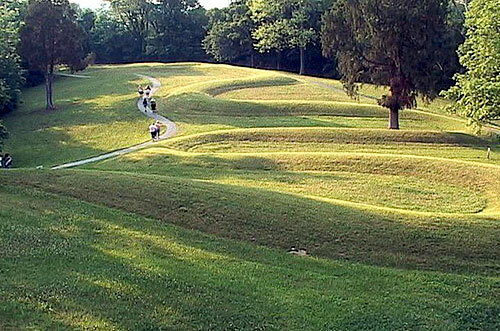 Also in Ohio, more than twenty thousand people visited Serpent Mound in 2010. Cahokia reports an attendance of approximately 320,000 people annually. If there is a conspiracy within the “mainstream” scientific community to keep the mound cultures a secret, we haven’t been doing a very good job of it. The implication that such sites have been systematically and intentionally destroyed or kept hidden for the nefarious goal of concealing the truth about Native American societies is self-evidently ludicrous. Beyond attempting to prove a nonexistent conspiracy to hide the mound-builder cultures from the public, the Lost Civilizations documentary presents what is to be interpreted as evidence of the movement of Old World people, specifically migrants from the ancient Middle East, to the New World. It then outlines the enormous impact these interlopers had on the already in-place indigenous societies. The bulk of this “evidence” consists of artifacts bearing written messages in Old World languages, especially Hebrew, and DNA that, it is claimed, proves a connection between the Hopewell mound builders of Ohio and ancient people from Israel. We will deal with these two sets of evidence in the second and third articles in this series, respectively. We are well aware that a claim underlying the Lost Civilizations documentary—that the mound-building people of the American Midwest were migrants from the Middle East 2,000 years ago—may be informed by religious doctrine. It is our position in this paper, however, that whatever inspires this claim is not nearly as important as the fact that it is plainly wrong. As such, we will leave it to others to assess the role played, if any, by religion in shaping Lost Civilizations and focus instead on scientific evidence relevant to that claim. Adams, J.R. 2010. Cahokia 101: A primer on a hidden past. National Museum of the American Indian, 11: 12–21. Barnhart, Terry A. 1998. In search of the mound builders: The State Archaeological Association of Ohio, 1875–1885. Ohio History 107 (Summer/Autumn): 125–70. ———. 2005. Early accounts of the Ohio mounds. In Lepper 2005, 236–50. Explorations in Grand Canyon. 1909. Phoenix Gazette (April 5). Available online athttp://grandcanyontreks.org/fiction.htm. Fell, B. 1976. America B.C. : Ancient Settlers in the New World. New York: Demeter Press. Fritze, Ronald H. 2009. Invented Knowledge: False History, Fake Science and Pseudo-Religions. London: Reaktion Books. Goebel, Ted, Michael R. Waters, and Dennis H. O’Rourke. 2008. The late Pleistocene dispersal of modern humans in the Americas. Science 319: 1497–1502. Halsey, J.R. 2009. The “Michigan Relics”: America’s longest running archaeological fraud. Presented at the Midwest Archaeological Conference, Iowa City, Iowa. Hodges, G. 2011. Cahokia: America’s forgotten city. National Geographic 219: 126–45. Iseminger, W.R. 1996. Mighty Cahokia. Archaeology 49(3): 30–37. ———. 2010. 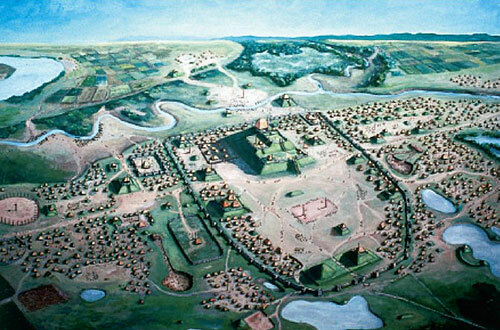 Cahokia Mounds: America’s First City. The History Press. Joltes, R. 2003. Burrows Cave: A modern hoax. Available online atwww.criticalenquiry.org/burrowscave/burrows.shtml. Lepper, B. 1995. Tracking Ohio’s Great Hopewell Road. Archaeology 48(6): 52–56. ———. 2004. The Newark Earthworks: Monumental geometry and astronomy at a Hopewellian pilgrimage center. In Hero, Hawk, and Open Hand: American Indian Art of the Ancient Midwest and South, edited by Richard V. Townsend and Robert V. Sharp. New Haven: Art Institute of Chicago and Yale University Press. ———. 2005. Ohio Archaeology: An Illustrated Chronicle of Ohio’s Ancient American Indian. Wilmington, Ohio: Orange Frazer Press. Lepper, B., and J. Gill. 2000. The Newark holy stones. Timeline 17(3): 16–25. Pauketat, T.R. 2009. 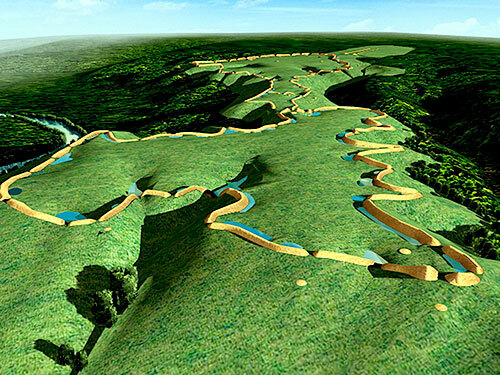 Cahokia: Ancient America’s Great City on the Mississippi. New York: Viking. Powell, E. 2005. The turquoise trail. Archaeology 58(1): 24–29. Silverberg, Robert. 1968. Mound Builders of Ancient America: The Archaeology of a Myth (original, unabridged edition). Greenwich, Connecticut: New York Graphic Society, Ltd.
Tainter, J. 1988. The Collapse of Complex Societies. New York: Cambridge University Press. Welch, P.D. 1991. Moundville’s Economy. Tuscaloosa: University of Alabama Press.